The Noah range incorporates years of experience in developing aerodynamic standards in the cycling industry. Synergies between experienced in-house R&D engineers and top sprinters in the pro peloton have led to industry-leading breakthroughs. Proven by world-class performances like Robbie McEwen’s Green Jersey win and André Greipel’s victories on the famous Champs-Elysées. The Noah has become a synonym to aerodynamic performances, and the Fast is certainly no exception. The Noah Fast Disc is Ridley’s top-level aero model, and was built from scratch with every feature rebuilt. This powerhouse is unrivalled when it comes to cutting through wind thanks to component integrations of the fork, handlebar, seat post clamp, thru axles and cables, next to F-Surface Plus, F-Wings and spacer profile updates. On this bike every rider is able to find his perfect position accurate to 1mm as result of our whole bike approach, where every part needs to fit together perfectly. Thanks to adaptations in the fork, seat post and handlebar the bike's total weight is about 250 grams lighter than its predecessor. Subsequently the rim version is able to stay below 7 kg on the scale, without the need of exotic lightweight components. Light as a feather, when speaking aero. The disc model adds about 500g because of the heavier groupset, brakes & wheels. The stiffness of the bottom bracket & head tube is further increased to its predecessor. You’ll keep feeling the power you’ll put on those pedals. At the same time, the lowered seat stays also create vertical compliance to enhance comfort. The Ridley Noah Fast is now available for pre-order, for a late September release. Why do I get pain in my arch when I ride? Contrary to popular belief, arch pain does exist within cycling. The long held view that arch pain/strain only occurs with running or ambulatory activities is incorrect. Why? As we know, cycling is an incredibly repetitious sport. With repetition, there is huge potential for a small issue to become a large one over a period of time. Generally, the work performed by your foot can handle the rigours of cycling but in some cases, certain foot types can generate arch pain. The location is typically on the outside of the foot as opposed to the inside with runners. There a multiple reasons for outside (lateral) arch pain. The most common relates to the shape of the foot and the incongruent shape of your stiff carbon cycling shoe. In many people, the outside of the foot is quite flat (I hate the term lateral arch) and the cycling shoe in this region certainly isn't. Different cycling shoes vary in their 'drop' and if your foot can't bend around this carbon shape, then pain will emerge over time. Different shoes have differing levels of sole curve which can accentuate this issue. Another reason for lateral arch strain relates to the width of the foot and compression from the cycling shoes upper on the lateral border. There is muscle, nerve and vascular tissue on the outside of the foot in that location and constant compression will trigger an ache. Another cause for lateral pain is fatigue and strain on the small muscles on the outside of the foot when under load. The lumbricals and abductor digiti minimi quinti muscles (yes, that's their real names) are located in the region and act as stabilisers for the foot when under pedal load. Certain foot types, pedaling styles and lower leg angles can place higher loads on these structures causing fatigue and pain over time. An understanding of the mechanics central to the problem is required to fashion a solution. If you suffer from foot strain or other niggles when you ride, make a time to see our Podiatrist or Physiotherapist for an assessment. We have all the tools required including bespoke cycling insoles required to reduce peak load on these structures and allow you to get more enjoyment from your riding. When you're busy in the middle of a business, it's easy to forget the huge changes that have occurred across the past few years. We started creating Carbon Cycling Orthotics in 2009, and at that time, we weren't planning on creating a comprehensive Health Practice in Milton, Brisbane. With the addition of Physiotherapy and Bike Fitting, we can now manage the full range of services that athletes require. We now have the ability to fully cater for the needs of cyclists and multi-sport athletes from start to finish. This means advice for the beginner on bike servicing and catering for their initial set up needs. We can help those suffering hot spots or poor shoe fitting with our Podiatry services and Cobra9 Cycling Orthotics. We can modify a bike during a fit within our workshop and change handlebars and stems easily and professionally. Physiotherapy and Podiatry can work together to ensure a comprehensive treatment platform is issued. We can provide the exercise programs and tools required to ensure injury risk is minimised and follow that up within our coaching programs. Our coaching programs can be measured against testing provided by our Exercise Physiologist. We can source and set up new bikes for clients alongside our workshop and bike fit services. Ongoing body maintenance is managed by our massage therapists who provide feedback to Physiotherapy as required. All these seperate but linked services are provided right here in Milton and offered in conjunction with access to the best coffee available in the 4064. That's right, you can grab a Fonzie Abbott coffee from our cafe while you wait. 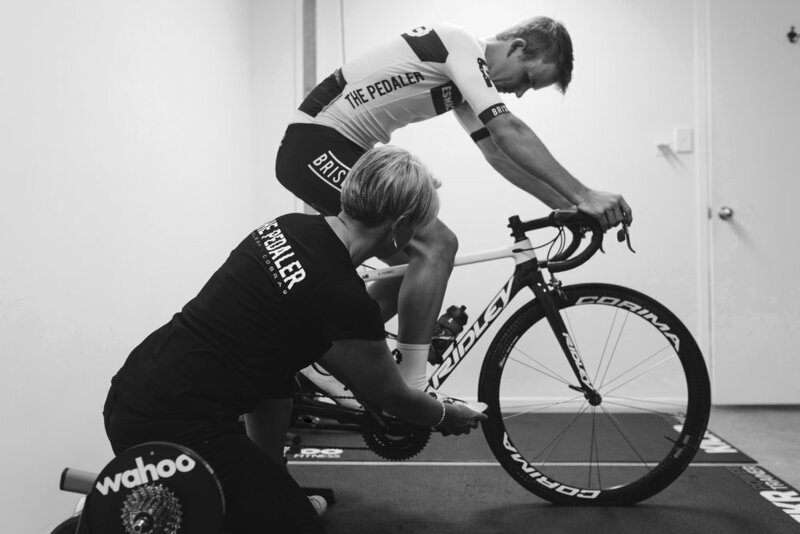 We start with your current bike, on which you will receive a fit assessment from our in house Physio, Anouska. From this, we can make note of any major differences between your old bike, and your desired new bike. Frame sizes are not all created equal, and it is important that we consider that you may not fit the same frame size across different brands. A great example is Colnago's range, a 52s has a 54cm Centre to Centre top tube, so if you are riding a 52cm frame and are looking at a Colnago, you may be better on a 50s, which has a 52cm Centre to Centre top tube. Upon assessing your former position, we will also determine measurements for your stem length, bar width, seat post set back, saddle type, crank length and pedal offset. To determine these, we look at flexibility, riding style and ultimately what you want to be getting out of the bike. After that, we order your new frame. When your new frame-set arrives in store, we give our customers the option to build it up with our 3T test range. This allows us to look at you on your new bike, and make any changes that we see fit, without coming to the awkward realisation that the stem we thought would work for you, does not.... We then recommend our customers spend a week doing some real world testing of their new bike, and once you are happy with your fit, we can tie off the minor details of your build. We have found that this approach is the most effective way to ensure tour customers are always comfortable on their new bikes. Building dream machines for our clients is the most enjoyable and fulfilling job we undertake at The Pedaler, and all of them start as ideas that needs finessing. Have a chat to us at The Pedaler and experience the comprehensive and personalised approach that we are well known for. With The Pedaler situated close to the Primary School Catchments of Milton State School, Rainworth State School and Petrie Terrace State School, we are happy to offer our Podiatry Screening Service to all primary aged students at no gap*. This allows parents who have queries regarding their child's foot type, or concerns related to Sporting injuries and other aches and pains to have their children assessed and treated with no 'out of pocket' expense. Our head podiatrist, Nathan White, has two children studying at Milton State School, and understands that parents sometimes have questions that they are hesitant to ask based on costs and time concerns. This option removes that barrier and allows parents to have their children's feet fully assessed and helpful advice provided. Simply call or book online at The Pedaler and advise us that you are booking a Primary Screening Session (use the code 'Primary Screening' in the notes section of an online booking) and we will ensure your loved ones are looked after properly. Physiotherapist Anouska Edwards joins The Pedaler team. I've known Anouska for around 10 years initially as a rider on the Pensar Race team where my mates Hads and Terry were racing and also through the early incarnations of Twittersphere under the Fittoride handle (correct use of handle?). There is still an unanswered direct twitter message from Anouska to the Cobra9 twitter feed from 2011 that I promise I'll get around to responding to at some point. Early on, I knew Anouska was a good physio. Good physiotherapists have a way of finding themselves in ever increasingly important and interesting roles. Anouska always seemed to be working with a National team of some description. When Anouska moved to the UK a few years ago, we touched on the idea of some mutual work for the UK team whereby Anouska's physiotherapy service could work in conjunction with my Podiatry training. We have both worked amongst cyclists for a huge period of time and simply there are still not a whole lot of practitioners in our field where this is the case. Given how highly I regard Anouska's skillset, the notion that she would like to work with me on occasion is a huge compliment, or at least I'm taking it as such. I'll press Anouska on this point when we have coffee next. Now that Anouska has returned to Australia, we finally have the opportunity to work together. I for one, am pretty excited by the prospect. When we were looking for a Physio to complete our team of health practitioners at The Pedaler, getting a professional of Anouska's quality was the highest priority, and her return from overseas is extremely serendipitous. Initially Anouska will be treating once a week from our rooms starting on the 19th of February. You can book online or call us to schedule. Where required, Anouska and myself may consult together to ensure we have the best possible treatment outcomes going forward for previous and future clients. Anouska is the physiotherapist of choice to ensure you can ride pain free and with improved function. Her twitter handle says it all - Fittoride. I can't put it more eloquently then that. It's that time of the year again. For most health insurers, December 31st marks the point where your benefits reset. It means, if you want a 2nd set of orthotics to use in your cycling or walking shoes, now is the time to use your benefits prior to the reset period. All our valued clients at The Pedaler are entitled to 2nd set of orthotics with no 'out of pocket' costs with the use of their Private Health Fund*. Make sure you book a time, or give us a call to avoid missing the December 31st deadline. Hot and dry westerly winds swept in across the range this morning as the team arrived to stage 3 in the township of Tyalgum.....a familiar but typically difficult hunting ground for the Cobra's. The boys were calm and positive after a solid day out yesterday, and DS Prete set out providing the strategy for the day's race. Ensuring all bases were covered, a potential podium was on the cards, and hopefully a stronger result in the teams classification. From the drop of the flag at around 1km into the race it was ON! With a flurry of attacks.......Liam Nolan was first to pounce and went with an early break of around 8 riders, which got out to around 30sec at one point. Unfortunately Liam had a mechanical which ended his race prematurely. The race came back together soon after where more attacks were being launched off the front.....Dave Edwards was in most of these from what we could see from the car....but at this stage, the peloton wears not letting anything get too far ahead. Nearing the end of the 1st lap with the weather already starting to take its toll, and the climbs beginning, the elastic finally broke and a single rider from Olivers Racing (the eventual winner by 6min!) broke free, solo with approx 19 riders chasing and in pursuit. From this group of 19 riders, Olly broke clear with Kane Richards (McDonald's) and they then spent the next 60kms or so chopping off into the searing heat and brutal cross and head winds. With the Olivers racing rider gradually taking more time from Ollie and Kane, and from the chasing bunches,.....a smaller group of 5 riders bridged across to Ollie with approx 25km to go. Olly managed to grit his teeth, drink one more coke, and take one more gel and hang on with this group until the last KOM.....just losing contact at the top coming in a very respectable 6th, moving himself into 5th on overall GC. Jono Butler had another consistent day finishing in the first chasing bunch in 14th and holds his GC position in 15th. Mitch, Josh and Tim all rode strong in the peloton, finishing in various bunches on the road. The Team now sit in 4th on GC....a huge result! An equally big day and kudos to all the support today.....with the weather so brutal....and with various mechanicals and breaks everyone was stretched and had to push hard for a excellent team result. Now back at our digs for a icy cold refreshing ale, showers and some rest before another hot and windy day in the hills around Tyalgum tomorrow. Big thanks to Luke for generating some content after today's stage. All the guys were pretty shattered and getting creative can be trying. Cheers mate.